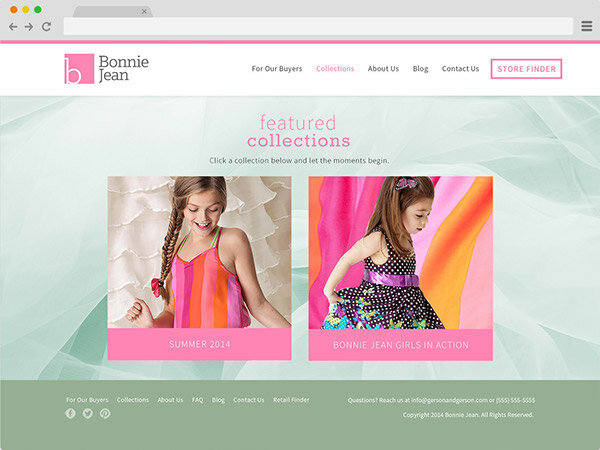 Bonnie Jean, the largest U.S. wholesaler of children’s dresses with $80 million in revenue per year, wanted a more engaging online presence to build cachet around their 80-year-old family owned brand and appeal to a new type of retail buyer. Bonnie Jean's buyers had traditionally been from large department stores, but with the recent downturn in the department store industry, they lacked brand recognition among consumers and boutique buyers. They needed to expand their digital presence in order to raise brand awareness among consumers and find new buyers. 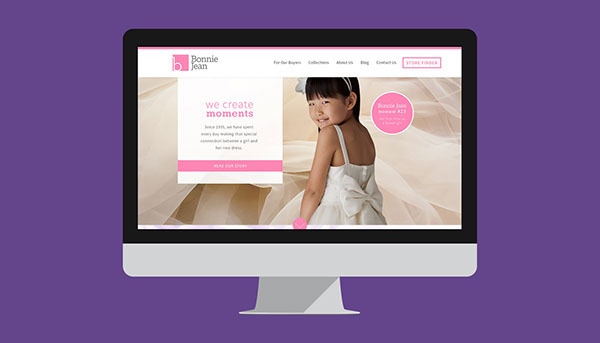 As the principal designer on this project, I revamped Bonnie Jean’s B2B online presence to increase brand awareness among boutique retailers and consumers. 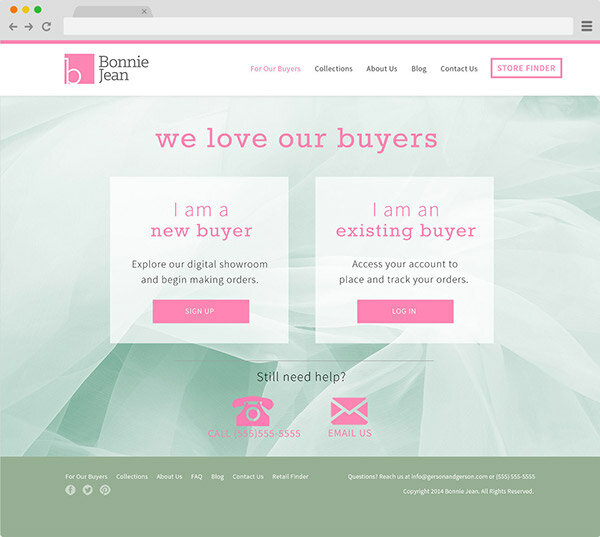 Our team built a more intuitive B2B site, making it easier than ever for buyers to place wholesale orders online and for consumers to reach out to the company and find Bonnie Jean retailers near them. 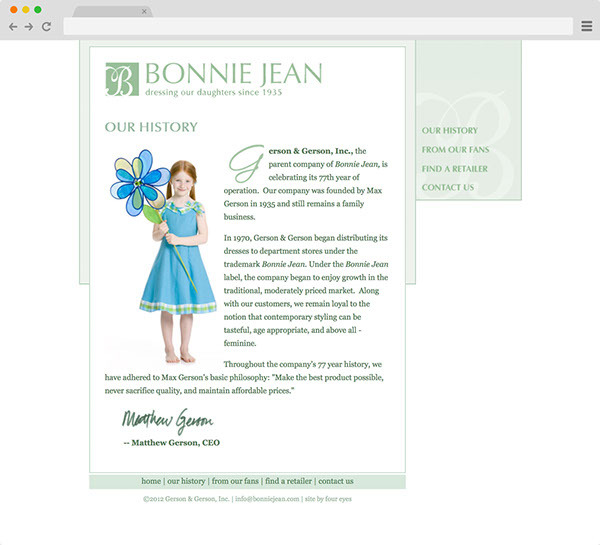 The homepage showcases beautiful dresses by Bonnie Jean and introduces the branded content franchise “Bonnie Jean Moments,” little backstories to each of their designs. Each panel of the homepage surfaces content and links to subpages within the site, including the collection photo galleries, buyer's page, the blog, and the contact page. 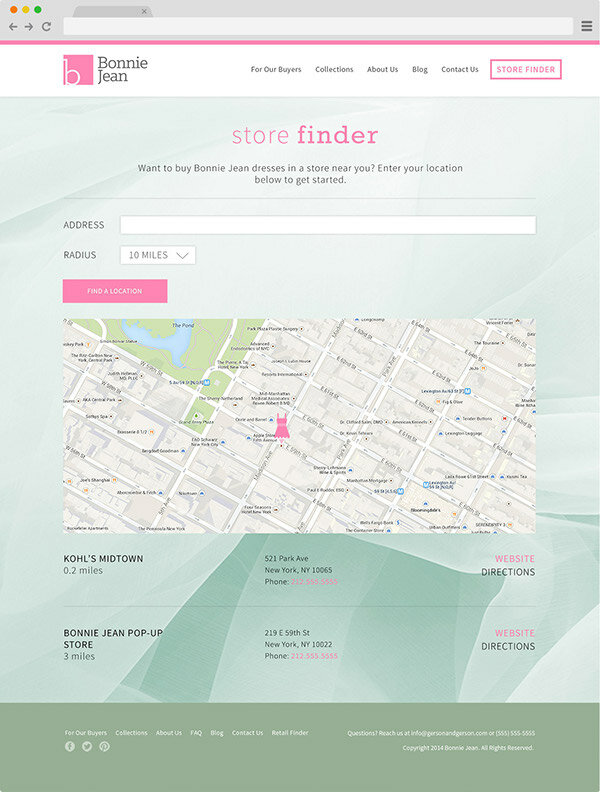 Although the site is intended for buyers, many visitors to the site are consumers searching for a specific dress, so the Storefinder and contact information are prominently displayed. 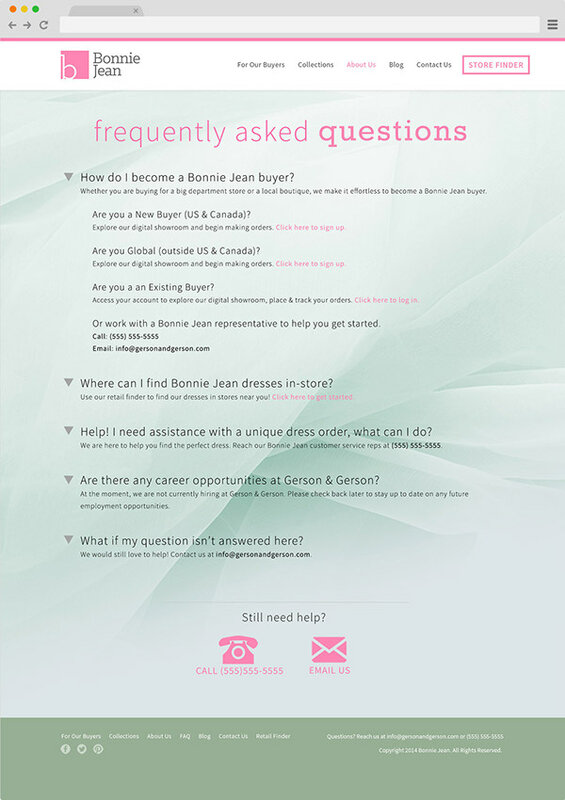 Easy to use Storefinder and Buyer's accounts make it simple for buyers and consumers alike to purchase Bonnie Jean dresses. Image galleries feature photos of designs from past and current collections, as well as happy customers wearing their dresses. Bonnie Jean Moments link to original content on the blog that helps to attract more visitors to the site and build brand awareness. Along with social media outreach, posts about contests, giveaways, and limited edition designs increases customer engagement. 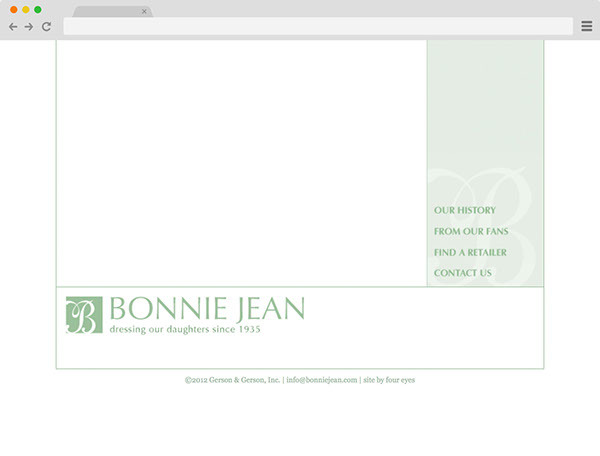 Founded in 1935 as a family company, Bonnie Jean has had a storied past. We use an illustrated personal narrative from the CEO to explain the history of the company and to show visitors what sets Bonnie Jean apart from other dressmakers. 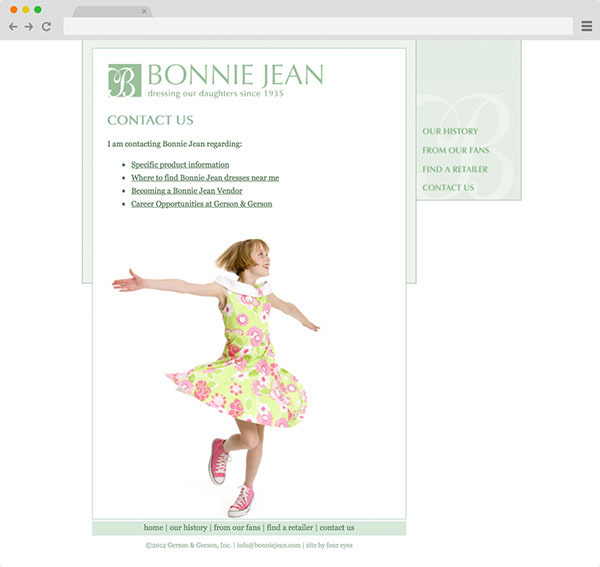 The existing Bonnie Jean site did not surface any content on the homepage and projected an old-fashioned brand image with very little online support for buyers. In addition, it was not mobile-friendly and the frames-based layout offered little flexibility for displaying larger amounts of content. Very little content. 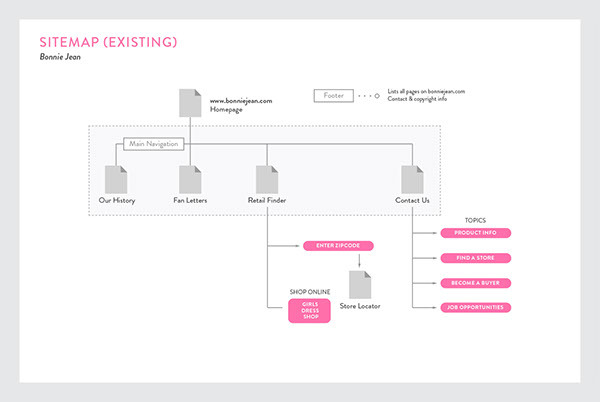 This was a B2B site with virtually no pages or information for buyers, which had to be addressed in the redesign. 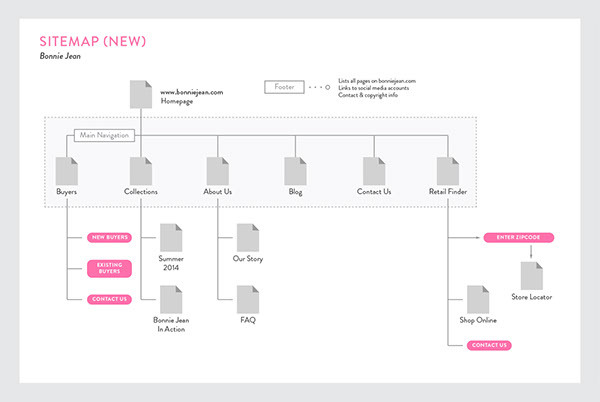 On the new site, visitors get a glimpse of all the content within the site on the homepage. This way, they can browse according to their level of interest, and someone whose primary goal is to find a retailer or login to their buyer account can still learn more about the brand through the front page of the site. In keeping with the primary purpose of the site, links to the Buyer's page and Storefinder are now much more prominent. Buyers enjoy online support through NuOrder and can register or log in to their accounts through the official Bonnie Jean website. 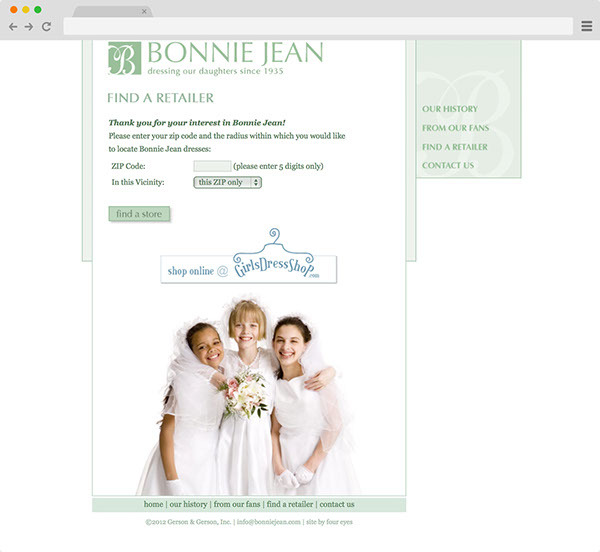 Bonnie Jean is an established brand, but in many ways a newcomer to the digital space. Launching a new B2B site provides great opportunities for rebranding, consumer engagement, and customer acquisition. Although in the past, brand differentiation among wholesale brands was not considered as important as long as large stores were willing to buy, we believe that the modern consumer is both saavy and brand-conscious, especially since so much information is available online. By appealing to smaller retailers and consumers, Bonnie Jean branches out from their traditional customer base, reaches new audiences, and cultivates brand loyalists. 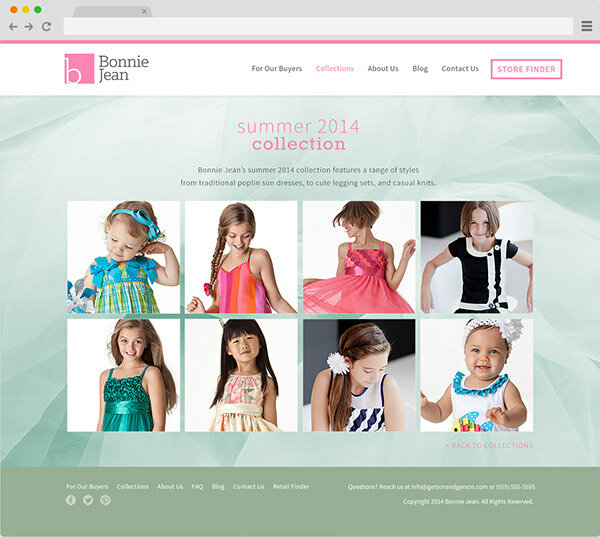 We created a new B2B web experience for Bonnie Jean, the largest U.S. girls' dress manufacturer.